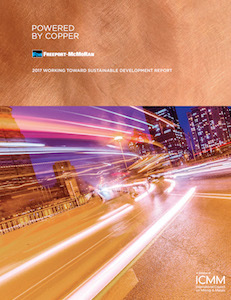 Freeport-McMoRan’s 2017 Working Toward Sustainable Development Report now is available online. Titled "Powered by Copper," the report provides information on the company's sustainability programs – including approach, focus areas and performance targets – and highlights the company's progress made on key issues affecting the company and stakeholders. Ways the company is helping to advance the United Nation's Sustainable Development Goals. Freeport-McMoRan’s 2017 Working Toward Sustainable Development Report also includes some of the company's sustainability programs and initiatives worldwide, with photos throughout the report showing these efforts in action. For additional information on Freeport-McMoRan's sustainability programs, please visit the Sustainability section of fcx.com.